Learn and master drawing a cube with three tones and you can draw most anything. Once you get the concept that highlights have highlights and shadows have shadows, the rest is cake. Q: "How do you carve a wooden Indian?" A: "Get a big hunk of wood and carve away anything that doesn't look like an Indian." ... although the biggest impediments I think I've seen to people who can't draw seem to be the failure to realize that shapes have shape & perspectives have perspective. I can draw a mean stick man! 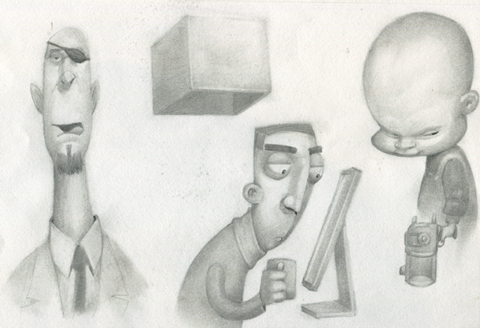 "Learn and master drawing a cube with three tones and you can draw most anything. Once you get the concept that highlights have highlights and shadows have shadows, the rest is cake." John - you say that like it is easy. For me, I don't think so. And yes, I noticed that the "cube" has no bottom. "and the rest is cake," Okay, that is glib. It doesn't take into account HOW each drawing project merges techniques. But I'll try this: Like zeros and ones make up a binary code that are used for amazing digital creations, I suggest mastering how one determines subtle light and shadow is the "zeros and ones" of classic drawing. There ain't NOTHING easy about the learning process. But he method is clear enough. That was pretty much my main point, but I wanted to write it in a way that might be perceived as humorous. I know that in some of my old drawings (of which I have only a few--portfolio was stolen) I got so focused on certain elements that the perspective is warped (in a bad way--not like your drawings here). I've also attempted subjects that I could "see the shapes," but there was something keeping me from accurately rendering the distinctive details so that what I was attempting to draw was recognizable as what it was (or what I intended it to be). This page contains a single entry from the blog posted on July 19, 2012 12:21 AM.